Cast: Sonequa Martin-Green, Jason Isaacs, Doug Jones, Shazad Latif, Mary Wiseman, Anthony Rapp, James Frain, Michelle Yeoh, Rainn Wilson. Running Time: 4-disc box set. Whether you’re a fan or just sci-fi curious, Star Trek: Discovery is one box set that you won’t regret adding to your collection. Forget what you’ve heard. Forget what you’ve read. Star Trek is back, and whether you’re a fan or just sci-fi curious, Star Trek: Discovery is one box set that you won’t regret adding to your collection. Marking the return of one of the most iconic and influential global television franchises, the debut season of Star Trek: Discovery arrives on blu-ray and DVD on November 19th from CBS and Paramount Home Media Distribution. And—alongside all 15 episodes— devotees can expect a wealth of featurettes including ‘Discovering Discovery’, ‘The Star Trek Theme’, ‘Creature Comforts’ and shorts that look into the worlds of prop-making, on-set food ‘design’, and the show’s staggering SFX. Following Star Fleet’s continuing voyages, the series takes a daring new direction, with a new ship and new characters—but all set against an ideology and a history that’s enshrined in pop culture. Discovery has classic Trek in its DNA, with a timeline that follows on from the original TV series and not the new, rebooted films. Thankfully, the show runners (which include Gene Roddenberry’s son) have been careful to maintain the optimism that was such an important part of those classic shows–even if it is sometimes shrouded in events that shake the world to its core. 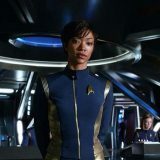 Whether Sonequa Martin-Green’s Michael Burnham, Jason Isaacs’ Captain Lorca, and Doug Jones’ Saru will find the same place in your heart as Kirk, Picard, and co. depends very much on how you like your sci-fi. There’s a darker edge to Discovery. The characters are more complex, and take longer to truly get to know. The plots are sweeping, with a full-season story arch that offers much, but expects much from the audience. And–hold onto your hats—the show boasts a wealth of strong female leads which means that this isn’t just a boy’s own adventure. Girls get to join in the fun too. All this isn’t much of a surprise when you consider that many of us have gown up with Trek and, while we will always love our Captain, we’re now old enough to appreciate something with a little more meat on its bones than traditional stand-alone episodes could deliver. Season One promises great things. 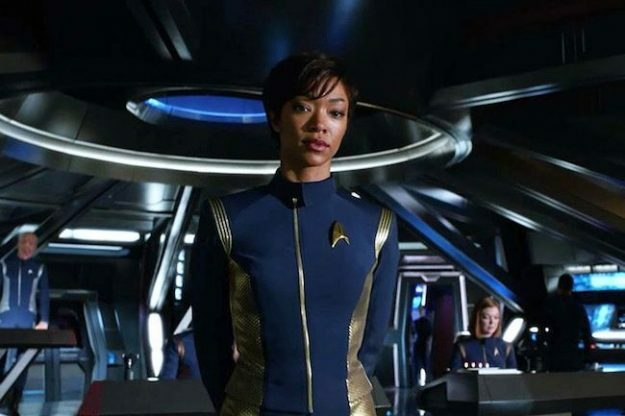 Will it continue building and become the successor to TOS and TNG that we’re all hoping for? Only time will tell. But based on Season One, where ever Discovery takes us, it’ll be somewhere that no one has gone before.